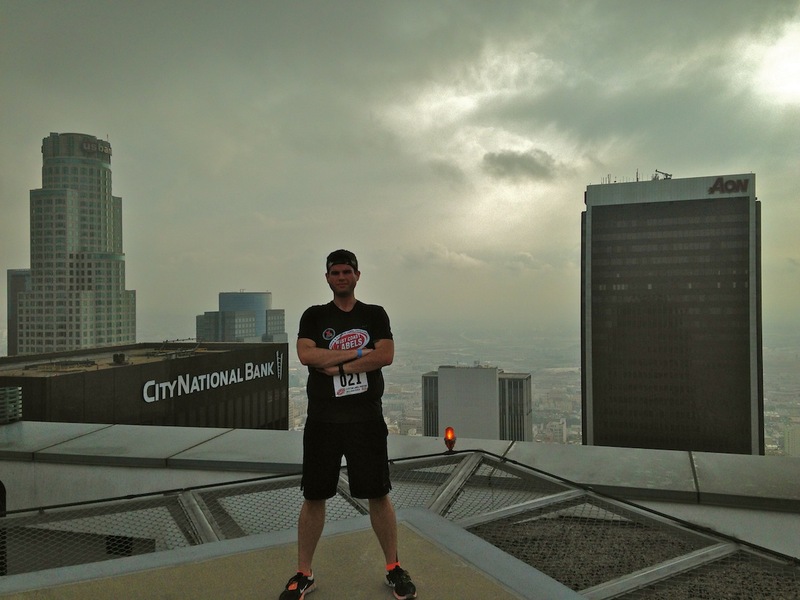 Race Recap: Los Angeles CF Climb 2014 | Keep It Up, David! Another weekend, another race! On Saturday, I competed in my third stair race of the past two weeks. 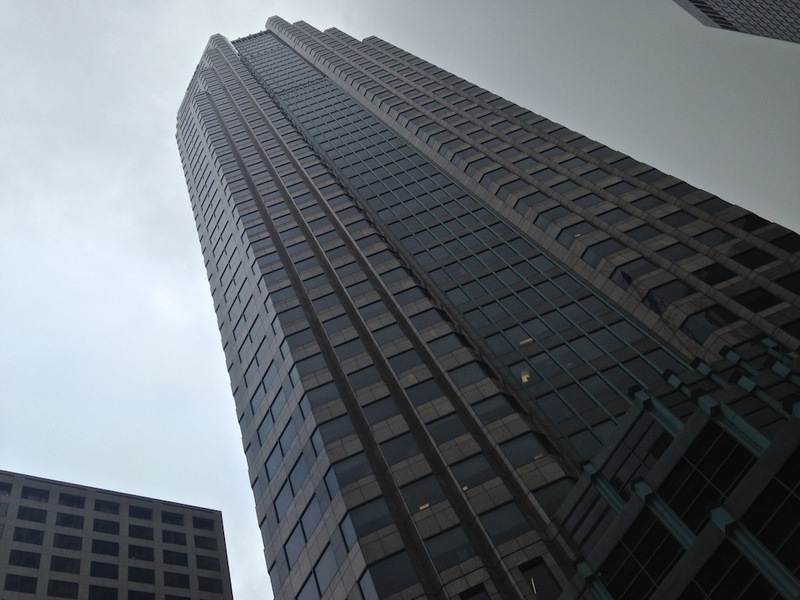 Whereas the first two were in Chicago (in Willis Tower and 300 North LaSalle), this race was close to home, in the Figueroa at Wilshire building in downtown Los Angeles. It’s 54 stories from sidewalk to roof. I didn’t feel great going into this race. I typically don’t sleep well the night before – my nerves get the better of me – but the night before this race was particularly frustrating. I woke up every half hour between 3:30 and my alarm going off at 6:30am. When I finally got out of bed, the first thing I felt was pain. In my foot. CRAP. I injured my foot a month ago, and the last thing I needed was a flare-up on race day. The pain was mild, at best, and didn’t impede my ability to walk or use my foot, so that was good. But it made me wary. What a crummy, gray day it was. 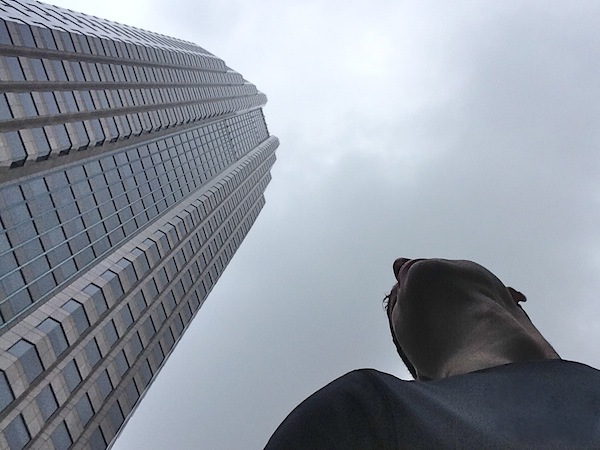 It was foggy and overcast, and as I sped down the freeway, I couldn’t even see the top of the skyline. 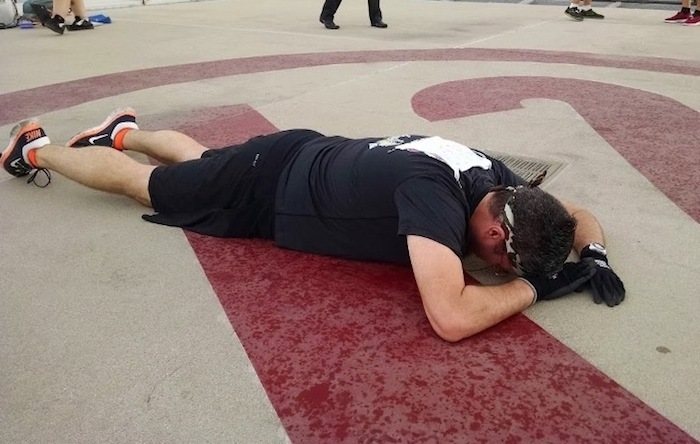 My goal for this race was to beat my time from last year, which was 12 minutes, 10 seconds. That seemed impossibly fast. How on earth did I do that last year? How on earth would I ever beat it this year? I’m familiar with the stairwell. I’ve raced in it before, and I had some awesome training sessions here before my trip to Chicago. I’m prepared. I’ve raced up 161 floors in the past two weeks, so I’m definitely in race mode. I know how to turn it on once I cross the start line. I don’t come to these races to mess around. I arrived with plenty of time to get my bib, stretch, and chitty-chat with lots of friends in the lobby. 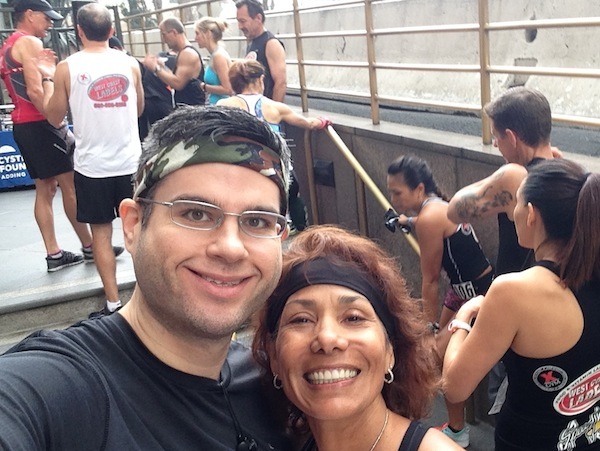 Friends are a good distraction before hauling myself up a 54-story stairwell! Plus, my friend Jeff used some Rocktape on my still-slightly-hurting foot, and I think it helped. Rocktape is used by all sorts of athletes. It pulls the skin away from the targeted area, which increases blood flow to that area, which hopefully aids healing and recovery. I had bib #021, and for the third race in a row, I was part of the Elite or Competitive wave of athletes that got to enter the building first. They were letting racers in the stairwell one every 20 seconds. My friend Jeannie and I took a photo while we awaited our turns. If you can’t see me in that picture, it’s probably because I’m wearing my new camouflage bandanna. 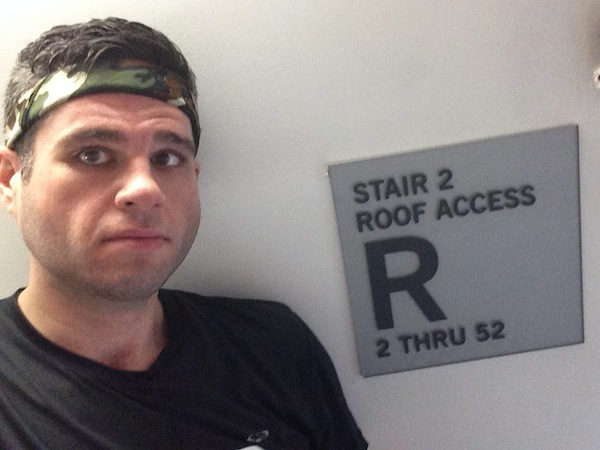 Once in the stairwell, I didn’t think about my foot, and it didn’t bother me. Instead, I focused on everything else: footwork, double-stepping, using the rails, staying positive. I used my familiarity with the building to my advantage, and pushed myself to stay strong to floor 21, which was a good milestone floor because that’s where the stairwell jogs a bit. Next was the long stretch between 21-49, where I knew I’d start to struggle and slow down. I was unexpectedly aided by three other racers – all friends, all much faster than me – who passed me. Each passing provided a nice jolt, because I sped up in an attempt to keep up with their pace. I couldn’t keep up for long – just a flight or two – but every bit helps! 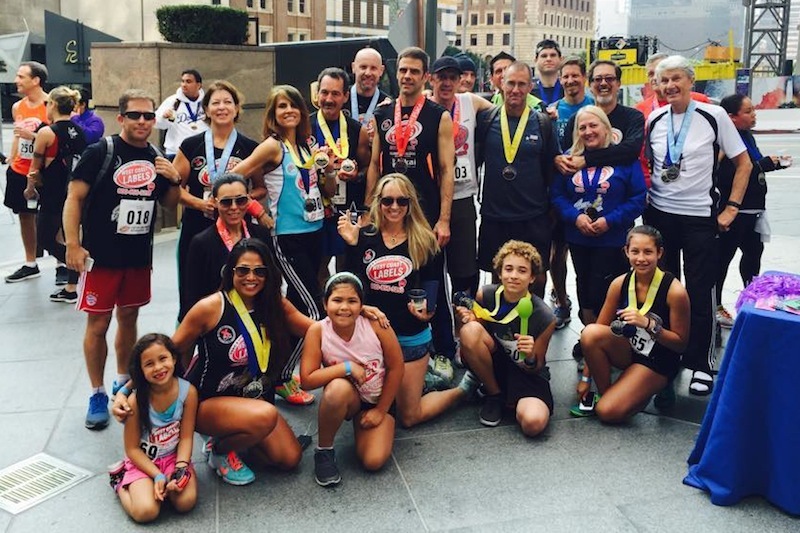 RELATED CONTENT: Check Out My ‘Races & Events’ Page For MORE Race Recaps! The 49th floor was my second target floor because that’s when the stairwell gets wonky. The pattern from the previous 28 floors goes out the window. Each of the final five floors has a different number of steps between them. Plus, only five floors remain: time to SPRINT! I gave it all I could, although there wasn’t much left to give. But I pushed. And pushed some more. 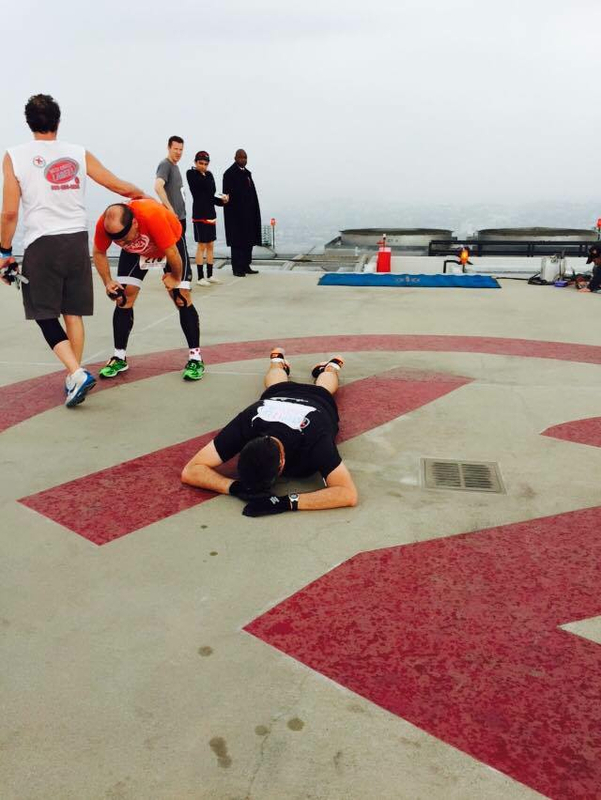 The last two floors came and went quickly, and before I knew it, I was on the roof, crossing the finish line. And then I stumbled a little further, my heart pounding, every muscle quivering. I dropped to my knees, walked my hands forward, and laid down. I couldn’t move. After a couple minutes, I got up and was able to enjoy the view. The view is a major reason why I do these races. On a clear day, you can see the entire city. Too bad it wasn’t a clear day! 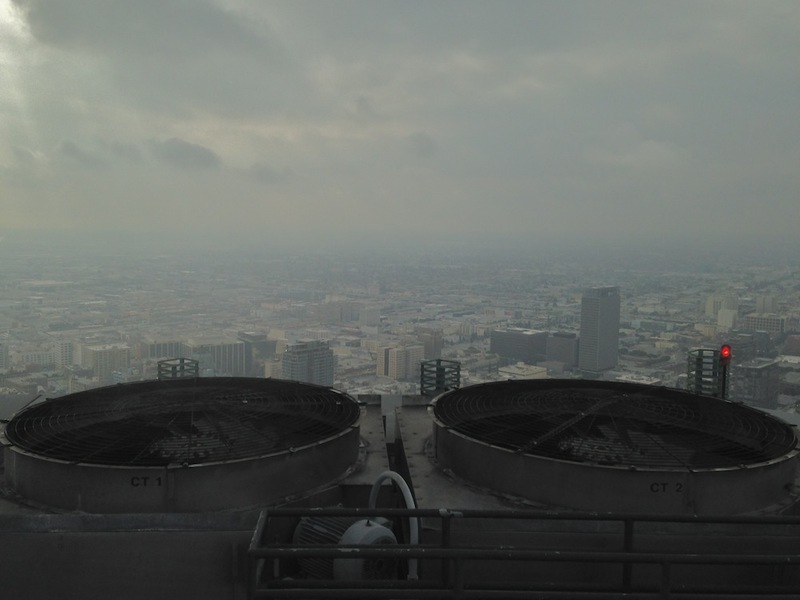 Those two buildings are the tallest and second-tallest buildings in Los Angeles, and both host a stair race. I love having a race photo with other race venues in it! EVEN MORE EXCITING: This race nudged me to my highest position yet in the national rankings. After coming back from Chicago, I was ranked #205 among all men in the entire country. I’m now ranked #203! Add this to my goal list for 2015: Break the Top 200! PS: Big thanks to all my donors, whose generous contributions to the Cystic Fibrosis Foundation made this race a reality for me. Sending lots of love to Philip and Mary, Joanne and Joe, Dana, Suzanne, and Jean! This entry was posted on Wednesday, November 19th, 2014 at 2:53 am and is filed under Uncategorized. You can follow any responses to this entry through the RSS 2.0 feed. You can leave a response, or trackback from your own site. Great post and an even better race! You are a stud. “The pain was mild, at best, and didn’t impede my ability to walk or use my foot… As I drove downtown…” Great segue! That’s the hallmark of a genuine “Elite” staircase racer! And your USB-Aon photo is iconic! CFF should use it for promos! Thanks, George! Appreciate, as always, that you read and comment. Hope all is well!